It feels like the build-up to Vega has been just shy of forever. And in a way it has been: AMD first announced the architecture back in March of 2016, and we’ve known for almost as long that Polaris would be a volume play, not a play for the high performance market. It would be Vega that would be AMD’s next high-end GPU, and true successor to 2015’s unique (if mistimed) Fiji GPU. Since then AMD has slowly been releasing details on the Vega architecture. Bits and pieces related to the Playstation 4 Pro, which incorporated some Vega features, and then a much more significant information dump at the start of this year with their Vega teaser, closely aligned with their associated announcement of the Radeon Instinct accelerator, which set some pretty specific guidelines for what kind of performance AMD was aiming for. Until today all we’ve known for sure is that Vega would be ambitious, but not unrealistic, and that AMD wanted to launch it by the end of June. So for toady’s AMD Financial Analyst Day, AMD has released a little bit more information as part of the next step of their campaign. The first Vega product to be released has a name, it has a design, and it has performance figures. Critically, it even has a release date. I hesitate to call this a full announcement in the typical sense – AMD is still holding some information back until closer to the launch – but we now finally have a clear picture of where the Vega generation kicks off for AMD. 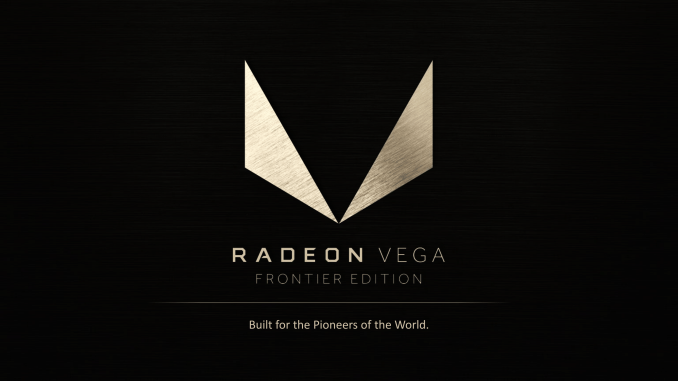 Say hello to the Radeon Vega Frontier Edition.